NEW YEAR NEW NEW YEAR NEW ME! One of a few New years resolutions was to write more blogs and be more active on the Gym website… so this is a start and be warned its a long one! In December I competed in my second British Indoor Rowing championship at the Olympic Park Velodrome. For me it was the end of a gruelling 4 month rowing programme in which I’d pushed my body day in day out and rowed over 450,000 metres so as to be able just to not come last in my age category! A lot of people have since asked me why do you bother and in the end asked it so much I started asking myself the same question… I guess my answer was I enjoy pushing my body and trying to improve as my body begins to decline and age creeps up… also I love to compete and having been banned from Football for 4 years it has replaced a competitive void. It’s also got me thinking as to the many reasons WHY people go to the gym and want to keep fit! In January, many people dust off their trainers, head down to the gym and recycle last year’s resolutions. I’ve always played sport, my Dad was a huge sports fan and from the age of 4yrs old I’d always be playing football, cricket and tennis with my dad in the back garden. As I was growing up we’d often be driving home from a sports match somewhere or dinner and 5 miles from home he’d say “right get out and run the rest of the way home”… I’d oblige willingly as it’d normally be accompanied with a bribe of the latest bit of new sports kit or something like that if i beat my previous best time.. Being active and fit has been a constant in my life since then bar a few minor injuries keeping me inactive for the odd month. But not everyone has that history of fitness and activity to draw upon and to some inversely, going to the gym to stay fit would be as alien a concept as operating a washing machine is to most teenage boys living at home with their parents! When one of our PT clients discussed her workout regime involving tyres and farmers walks, with her farmer husband, he looked at her quizzically and informed her that it sounded very much like “working on the farm or a building site” and that we should probably be paying her! During 90% of our species existence fitness has been about survival. Being physically able was a necessity for survival and in many lesser developed parts of the world it still is. I was lucky enough to visit rural Uganda a few years ago and the “economics” teacher at a school I visited had 4 cows he worked to plough fields. When he bought the cows at market he had to walk them 80 miles back to his village! 80 MILES in searing heat!! That’s the equivalent of Warminster to London. Being fit and active for him was essential for survival. Which makes me ask myself the question: what is the point of fitness in today’s post-industrial, mollycoddled Western life? Why do so many people feel the need to push themselves physically after a comfortable day sat in front of a computer screen and spreadsheets, before retiring to the comfort of the sofa or to the local Nandos? There’s two ways of answering this: “What does being fit even mean?”, and on an individual level, “Why is fitness important to me? I believe these questions are closely linked. I like many of you have been watching Blue Planet 2 and was wondering how a baby turtle with zero experience of life on earth is left to fend for itself and instinctively knows what route it must take and how it must sustain itself to survive.… I could relate to this to a degree because I feel fitness is a primal instinct at least for me anyway. I’ve always enjoyed that feeling of manual physical exertion or the happy soreness of hard work. The same feeling at the end of a tough football or rugby match.. I seek to replicate this sensation of hard work and reward through my training. I think you can find out a lot about yourself on so many levels through physical exercise, it’s also immensely and importantly mentally therapeutic. I’m sure people can relate when they have a lot on their mind maybe at home or at work but once you are in the middle of a tough workout or wod your body and mind is being asked so many difficult questions you lose the capacity to think about anything else other than getting through it. Conversely you may do your best and most clear thinking whilst out on your 10k run… This mental break and reprieve from life is I’m sure a huge part of why so many successful businessman still find time in their busy diaries to excercise daily. A friend of mine’s father was the CEO of the Worlds Biggest publishing company and at 60 years old he’d commute from the Cotswolds each day to his Canary Wharf offices.. he’d leave at 4am sharp every day so he could go to the gym or swim for an hour before work. He believed the benefits on his ability to do his job effectively were immeasurable and I buy into that 100%. I’m due a lengthy lay off this year for some surgery on an old injury and know it’s the mental release I’ll miss more than the aesthetic affects of exercise! However several experts in human evolutionary biology suggest that a desire to burn calories goes against our instincts; that humans are naturally lazy to conserve energy. When you’re a hunter-gatherer trekking five miles a day or a farmer toiling all day, this makes sense. I wonder though if there isn’t also an inverse instinct to move our bodies after too much rest. When civilisation removes the physical requirement to work, there’s a heightened awareness that this body – made for walking, running, digging, climbing and hunting – is wasting away. I don’t know whether this is truly instinct or social conditioning, but I know I’m not alone in this desire to ‘earn my right’ to eat and rest. If you’re reading this aghast at the thought of ‘wanting’ to exercise take comfort in the fact you’re not alone. Unfortunately most of the people that step into the gym in January won’t have considered the answer to either of these questions. In my experience this leads to a lack of focus and consistency (jumping from one fitness fad and diet to another) and a lack of results, because unless you know what you’re trying to improve how can you measure your progress? 1. Why do you want to be fitter? 2. What’s the point of fitness for you? 3. Because I want to improve my health. 4. Because it makes me feel good /better about myself. All responses boil down to two things. To ‘look better’ and to ‘move better’. From my experience that those who focus on the latter almost always achieve more from exercise than those who fixate on looking good. If your body shape becomes your sole focus, you’ll never be truly satisfied, whereas I regularly see proud, happy people after running/ rowing a 10km, beating their previous time on a WOD, doing their first “double under”, “muscle up” or squatting their bodyweight for the first time. Not only does a specific, measurable performance goal give you a clear motivation to exercise, and a deep sense of fulfilment when achieved, it’s almost inevitable you’ll change your body and health in a positive way too. So, as the New Year progresses and you think about changing your body for the better, take a moment to think about why you really want to make 2018 the year you ‘get fit’. And if you’re really struggling for a compelling answer, consider that the primary point of exercise is to develop and retain basic movement capabilities. Like the baby turtles in Blue Planet, it’s what we’re bred to do instinctively. For my thinking we only get access to one body and one life time to use it so I believe the want to see what it can do is inherent in all of us. 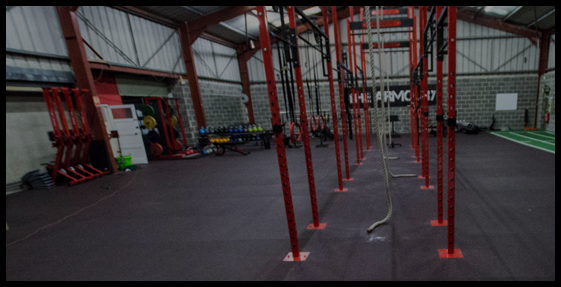 Elite level athletes all started from the same place as we do, and in the same way most average gym goers or novice CrossFit athletes do…once they start to see progress, achieve goals, the body make positive adaptations, it becomes addictive to keep pushing and seeing how far your body can progress. A lot of people just starting out with no exercise history need to be coaxed, encouraged, given metrics and realistic short term and long term goals. Once they start hitting the goals and seeing the improvement in the metrics it creates a snowball effect, the seed is sewn and the fitness bug gets you, it becomes a way of life and to an extent an addiction. For the people still sat on the fence about whether to go the Gym or to exercise…. I’ll leave you with this…. Not exercising your body is to me tantamount to owning a Ferrari but never taking it out of neutral… your body has been made to be capable of incredible physical feats and to me it seems a waste not to take it out of 3rd gear at least a few times a week. Of course you’ll stall a few times, you’ll lose motivation, you’ll get injured, you’ll get tired, you’ll get ill, you’ll think the results aren’t coming… I’d urge you to PERSEVERE as if you do it’ll be one of the best and life changing decisions you’ve ever made! You’ve only got one short life to see what your body can do so don’t waste it!